‘Travelogue’ was the first foray into sponsorship and public art commission by the National Transport Authority and they partnered with all the Dublin Councils and transport providers. The artist, Theresa Nanigian, engaged with a vast array of public transport staff and commuters over a 9 month period to solicit their stories and perspectives on public transportation, involving them in the creative process to celebrate the human drama played out on public transport in Dublin every day. In 2011, the National Transport Authority (NTA) made its first journey into sponsorship and public art commission in association with all of the Dublin councils and transport providers. Under the Per Cent for Art scheme, the authority put out a tender for art projects that would represent Dublin’s transport network. 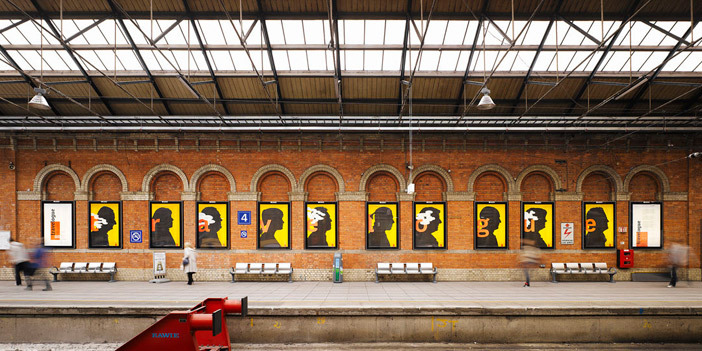 The winning proposal came in the form of Theresa Nanigian’s Travelogue, which aimed to celebrate “the human drama played out on public transport in Dublin every day”. The resulting project, which saw Nanigian spend nine months talking to commuters and public transport staff to get their perspective on public transport, was hugely successful both in its scope and recognition by the public. So much so that the decision to award the project this year’s Jim McNaughton Perpetual Award for Best Commissioning Practice was a unanimous one by the judges. Marian Wilson, head of service with the NTA says the project was aimed at enhancing the transport-user experience. “There’s quite a lot of organisational effort that goes into delivering public transport everyday and there’s a human story behind that. It was trying to tie the two things together, and to create an art installation that we could display on public transport,” she says. For artist Nanigian, the transport workers ended up playing a much greater part in the project than she first envisaged. “All of the service providers allowed me to come into their back offices and explore behind the scenes, and it was an interesting journey in terms of research. It wasn’t difficult to get folks sharing experiences. Nanigian went on to compile the stories, and took photos of the interviewees, using their silhouettes to add some anonymity and effect. The narratives were laid out on posters and placed at transport stops, on buses, trains and in stations around Dublin. A website www.travelogue.ie was also launched. From the man who was reunited with his long-lost family three days before his death due to his wife’s chance encounter with a taxi man, to the train driver who accidentally ‘kidnapped’ a child, the stories range from the poignant to the hilarious. “I do think the staff appreciated the opportunity to share their stories, as it became very much a celebration of their experiences and camaraderie,” says Nanigian. The scope of the project was particularly impressive. Dublin Bus negotiated with advertising company Clear Channel to obtain 250 bus shelters for the art for free. Metro Herald got involved as media partner and gave the project free ad spaces and editorial coverage. Nanigian said this had a significant impact on the number of website hits and the success of the project. Ruairi O Cuiv, public art manager, Dublin City Council, says the commission highlighted the great opportunities to bring art into direct contact with the public. “Art at its best is not a shallow engagement or reflection of something; it is quite complex and multi-layered, a fact that Theresa embraced, engaging so well with the public and workers. It really made the art work and the commission so rich,” he says. A collaborative approach was also important in the present climate, says O Cuiv. “I’ve worked in art and commissioning for many years but the bravery of NTA and the involvement of all the transport companies was tremendous. I commend them for putting their head above the parapet. We engaged so well with mutual respect, I’m hopeful the NTA will find the return on investment in this commission was so good that they’d like to do it or something similar again.